People who have diabetes are aware that there are certain foods that contribute to rapid glucose (sugar) spikes in their bloodstream. Those foods that raise blood sugar levels quickly in the blood are said to have a high glycemic index. Foods that contain simple carbohydrates, is one such example, which can break down rapidly during digestion, and are said to have the highest glycemic indices. Such carbohydrates require less energy to be converted into glucose, which results in faster digestion and a quicker increase in blood glucose. So, if you are trying to follow a healthy diet, here are few foods that you may need to restrict to keep your blood sugar in check. Refined products- Simple carbohydrates like polished rice, refined products (maida) made from grains, such as wheat, are extensively processed. Your body converts these refined products into glucose at a much faster rate than whole-grain products (brown rice, wheat, ragietc) and spikes the sugar levels instantly. Refined products are also found in: pastas, noodles, white breads, pastries, sandwiches, buns, pizzas, burgers etc. Starchy Vegetables- Some vegetables contain more starch, which is essentially a simple carbohydrate and hence they needs to be consumed in moderation: potatoes, sweet potatoes, yams, carrots, and beetroots. Fruits - All kinds of fruits are good for health but there are certain fruits that need to be consumed in moderation like mangoes, big bananas, pineapples, melons, sapota (chickoo), etc. However, these fruits may be a healthy alternative to candies or sweets for people with diabetes who experience slight dip in blood sugar. 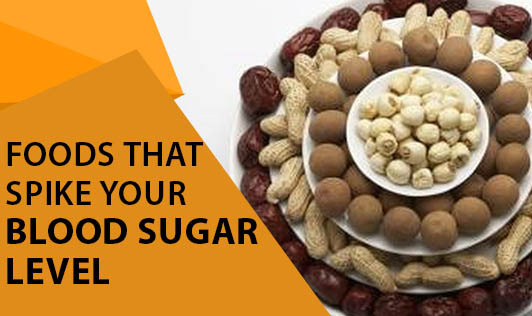 Other foods that spike your blood sugar include: bakery products, pastries, cookies, candies, chocolates,chips, biscuits, instant coffee, tea, most of the breakfast cereals, colas, soft drinks, direct sugars, syrups, squash, sweets, desserts, jellies, etc. So, speak to your Dietitian, who can help you choose foods wisely, and thereby, help you prevent a spike in your glucose levels.